As my first attempt to automate my electric heater, I have decided to develop a remote temperature monitoring system. This is the Part I of this project. I will try to be as thorough as possible on my explanations. Set up as per Fritzing schematics. After you download the Blynk App, you’ll need to create a New Blynk account. This account is separate from the accounts used for the Blynk Forums, in case you already have one. We recommend using a real email address because it will simplify things later. After you’ve successfully logged into your account, start by creating a new project. Select the hardware model you will use. Check out the list of supported hardware! NOTE: Don’t share your Auth Token with anyone, unless you want someone to have access to your hardware. It’s very convenient to send it over e-mail. Press the e-mail button and the token will be sent to the e-mail address you used for registration. You can also tap on the Token line and it will be copied to the clipboard. Now press the “Create” button. Drag-n-Drop - Tap and hold the Widget to drag it to the new position. Widget Settings - Each Widget has it’s own settings. Tap on the widget to get to them. Choose a name for your widget. Select the source of data. 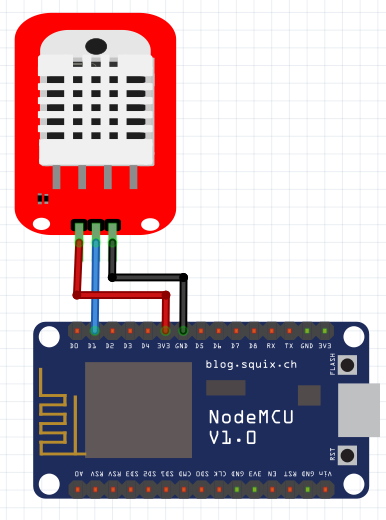 My case I am using NodeMCU. The most important parameter to set is PIN. The list of pins reflects physical pins defined by your hardware. If your value is connected to Virtual Pin 0 - then select V0 (V - stands for Virtual). You can add a label to it. When you are done with the Settings - press the PLAY button. This will switch you from EDIT mode to PLAY mode where you can interact with the hardware. While in PLAY mode, you won’t be able to drag or set up new widgets, press STOP and get back to EDIT mode. You will get a message saying “Arduino UNO is offline”. We’ll deal with that in the next section. Here's how it looks like when the project is running with no connection. The red number one should go once it is connected. Enjoy! Try adding graphs and other sensors to it! Next I am including a relay to turn a heater on and off remotely pressing a button and/or using a timer on Blynk! Step Four: Open a beer! Keeping my head busy! Looking for challenges! Trying to keep up with evolution! IoT is the future!